The ExCiteS research group and Mapping for Change, teamed up with Dr Catherine Holloway and Sarah Nicholson, Accessibility Engineering researchers at UCL, Ross Akin, an accessibility designer and users of the Queen Elizabeth’s Foundation Mobility Centre for a day long workshop. The aim of the study was to develop tools and methodologies for mobility impaired users to collect data on the topic of accessibility that would then facilitate the creation of more accurate and usable accessibility maps. The wheelchair users involved in this study have limited mobility skills. However, all users had prior ICT experience, including the use of apps, and did not have limited literacy skills. Some of the participants have weakened fine motor skills that may restrict their use of a typical app interface. 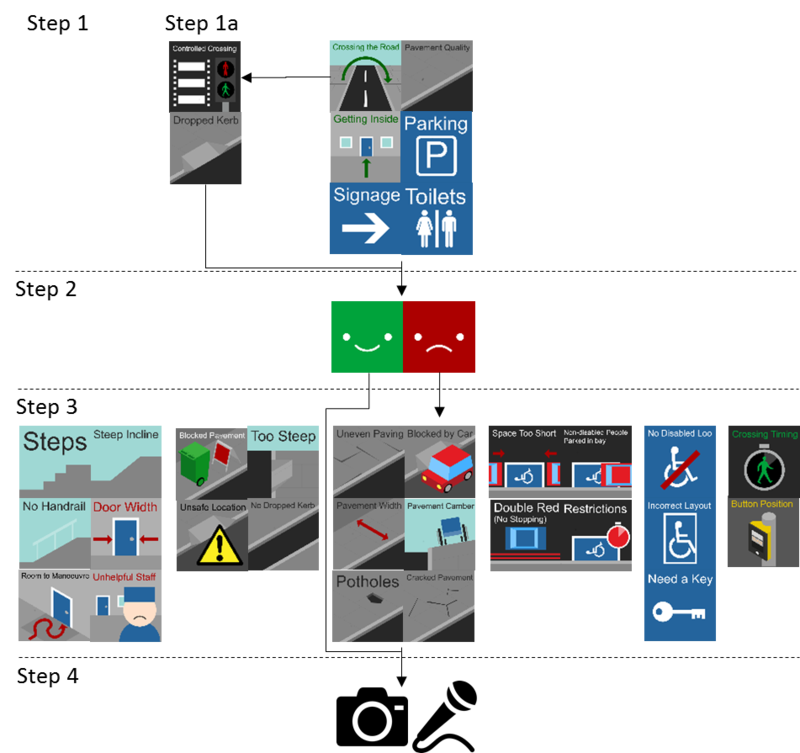 Step 1 of the decision tree requires the user to select an initial icon representing the category (for road crossings there is a sub-category in step 1a to select either dropped curbs or controlled crossings), step 2 to select the positive indicator (green ‘smiley’ icon) and then at step 4 capture a photograph or audio recording. Barriers, or negative accessibility point of interest, require an additional step which allows the users to more precisely select the type of barrier, for example when selecting ‘pavement quality’ at step 1 a user may then select ‘cracked paving’ as the specific quality issue at step 3.